Social protest has played an important role in Bolivia's recent political history. Ever since the national revolution of 1952, civil society has found success in turning to forms of mass participatory direct action for meaningful social change, largely responsible for the removal of unpopular Presidential administrations from office. Mass direct action campaigns, often in the form of street protests, have become engrained in the political process due to civil society and dissent under dictatorial regimes throughout the 1970s, with protestors often standing up for democracy in the face of dictatorships. Though rich in mineral and energy resources, Bolivia has long been one of South America's poorest countries. Most Bolivians are low-income subsistence farmers, miners, small-scale traders, and manual laborers. Thus, labor organizations, predominantly in the mining industry, play an influential role in the political process and often promote leftist politics, speaking on behalf of a majority populace. Though publicly condemned by the government, Bolivia's economy often relies on the illegal coca narcotics trade, which in 1982 was a $2 billion industry, a significant economic sector. On October 10, 1982, marking Bolivia's first democratic election in 18 years, Hernán Siles Zuazo was elected president, backed by the Democratic Popular Union (Unión Democrática Popular). Signaling the end of a previous military dictatorship, Siles Zuazo's cabinet was comprised of a large leftist alliance including the Bolivian Communist Party (Partido Comunista de Bolivia), the Left Nationalist Revolutionary Movement (Movimiento Nacionalista Revolucionario de Izquierda), the Revolutionary Left Movement (Movimiento de Izquierda Revolucionario, MIR), and the Christian Democratic Party (Partido Demócrata Cristiano), as well as the three central labor unions: Central Workers Union (Central Obrera Boliviana), the Associated Miners' Union (Federación de Sindicatos de Trabajadores Mineros de Bolivia), and Confederation of Peasant Workers of Bolivia (Confederación Sindical Única de Trabajadores Campesinos de Bolivia). Though Siles Zuazo was popularly elected into office, the majority of Congress was made up of opposing parties, the Historical Revolutionary Nationalist Movement (Movimiento Nacionalista Revolucionario Histórico) and Nationalist Democratic Action (Acción Democrática Nacionalista). Soon after taking office, Siles Zuazo became caught in political tension between the popular-front Bolivian majority (eager to claim power in the early years of a young democracy) and increasing pressure from an anti-communist agenda of the IMF and the Reagan Administration in the U.S. Various U.S. Republican Senators made it clear that the status of U.S. aid to Bolivia was in jeopardy unless President Zuazo addressed his country's drug trade. Faced with a large budget deficit and in the midst of a national economic crisis with rising unemployment levels, the President sought to repay foreign debts and curtail extreme hyperinflation. Influenced and arguably intimidated by the USA's foreign policy, Siles Zuazo pushed forward an aggressive anti-narcotics campaign, vowing to dethrone Bolivia's “Cocaine Kings.” Siles Zuazo's anti-coca campaign did not go over so well with the Bolivian masses at a time of rising unemployment—peasants in predominantly rural areas increasingly relied on the revenues from the crop's cultivation, processing, and trade. Because of the fundamental role they played in the President's election, Bolivian labor organizations held ambitious goals for the new Bolivian democracy. Labor interests demanded cogestión, in which workers and labor representatives had roles on company boards and government committees. Though unions demanded a majority of worker voices across governing bodies, the government argued for equal representation between workers, labor representatives, government officials, and private businessmen. On February 20, 1983, in what seemed to be a politically motivated move for power, the Left Nationalist Revolutionary Movement called for the exclusion of militant Revolutionary Left Movement (MIR) politicians from President Siles Zuazo's cabinet. Siles Zuazo was forced to oblige. Among increasing political divisions within the President's cabinet, Vice President Jaime Paz Zamora, an MIR leader himself, sought distance from Siles Zuazo, while the MIR joined the opposition party in Congress. Two months later, on April 19, under the leadership of Juan Lechín Oquendo, the Associated Miners' Union (FSTMB) occupied several private mining companies and imposed cogestión, after which the Central Workers Union (COB) demanded political participation along with the Confederation of Peasant Workers of Bolivia (CSUTCB). In November 1983 the government rolled out a new economic package, resembling neoliberal policies that were being promoted throughout Latin America largely by US-affiliated programs. Attacking the new economic package and accusing Siles Zuazo's administration of working for the IMF, COB launched a wave of national industrial strikes. Congressmen increasingly called for the impeachment of Siles Zuazo, and via Senate censure forced him to appoint new cabinet members after the removal of former members. On April 10, 1984, the MIR reentered the government coalition, replacing the Christian Democratic Party (PDC). The MIR called publicly for the resignation of President Siles Zuazo, or an early election. The COB, which at this point was made up of mostly radical Unified Revolutionary Directorate (Dirección Revolucionaria Unificada) organizers, opened a second opposition against the government. People began to proliferate street protests into 1984, with most activists demanding higher wages amidst hyperinflation, reaching above 300 percent. La Paz's central bank ceased operations after employees imposed a strike, and the COB launched a series of 72-hour general strikes, demanding wage increases of 400 percent and a suspension of debt payments to all creditors. In response, the government agreed to halt foreign debt payments, and increase wages by 130 percent. Leaders of the major left and right parties called for Siles Zuazo to resign, for different reasons. On June 30, 1984, as part of a failed military coup, President Siles Zuazo was kidnapped by General Cayoja, a military official. After the unsuccessful coup attempt, Congress didn't cease to call for the President's impeachment. In October of 1984 President Siles Zuazo, at the age of 71, began a hunger strike in response to an oppositional Senate censure of his administration. The censure was sparked by allegations that he had sent his top drug enforcement official Rafael Ortego to secretly negotiate with Bolivia's most powerful drug lord, Roberto Suarez Gomez. On October 25, the President declared on Bolivian national television: “In an act of supreme protest, I have decided to declare a hunger strike to restore a climate of peace and reflection by all Bolivians.” At the start of the hunger strike, Siles Zuazo also ordered government raids of five Suarez jungle estates, dealing a major blow to the coca trade. Days later, with inflation reaching 1,000 percent and a government crackdown on the coca industry, the only dependable income for thousands of Bolivian peasants, over 5,000 workers in Cochabamba and other industrial cities took to the streets in protest of Siles Zuazo's anti-narcotics streak. The President ended the hunger strike six days later, after accepting a deal mediated by bishops from the Bolivian Episcopal Conference and Catholic Church. On November 14, 1984, the Catholic Church organized another meeting between all the major political parties and labor organizations. After this meeting, Congress decided to call early elections by the end of summer 1985. 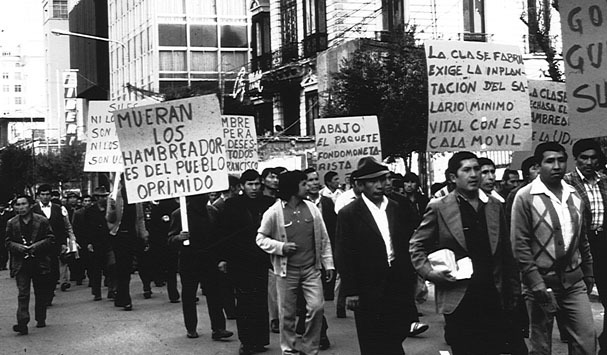 In March 1985, the labor organizations organized a massive general strike in La Paz in response to yet another economic austerity plan by Siles Zuazo's administration in which the prices of food and transportation were increased and currency value decreased. Led by Felipe Tapia and the COB, the strikers called for higher workers' wages, stable food supplies, price controls, and the President's resignation amidst 3,400 percent inflation. 10,000 miners from all over Bolivia flooded the streets of La Paz daily, housed at university campuses and union halls. The general strike lasted for 16 days, and spread to the southeastern oil refinery cities of Santa Cruz and Chuquisaca, organized by city councils that demanded the state repay them owed taxes. Government offices, mines, banks, and most small businesses were closed. A fraction of miners in La Paz became violent, blocking traffic and setting off explosives, prompting the government to deploy military forces throughout the city. After 16 days, on March 24, 1985, the strikers accepted a government offer to quadruple the minimum wage, and agreed to end the strike. The striking miners, led by Lechín and Tapia, had lost steam, continuing to mobilize with no clear goal or direction. After lifting the strike, the COB miners notably parted declaring “Volveremos–We will return!” In light of consistent street protests and worried by the prospect of future general strikes, President Hernán Siles Zuazo agreed to a special election, and was unseated from the presidency on July 14, 1985. The succeeding neoliberal Revolutionary Nationalist Movement (MNRH) administration of Víctor Paz Estenssoro was arguably more at odds with the campaigners' beliefs, setting Bolivia on a course towards privatization that backfired in the early 2000's. Ever since the national revolution of 1952, civil society has found success in turning to forms of mass participatory direct action for meaningful social change, largely responsible for the removal of unpopular Presidential administrations from office. Mass direct action campaigns, often in the form of street protests and strikes, are almost embedded in the political process (1). “Bolivia Faces New Pressures.” New York Times. June 11, 1984. Buitrago, Miguel A. “Civil Society, Social Protest, and Presidential Breakdowns in Bolivia.” Presidential Breakdowns in Latin America. Llanos, Mariana and Marsteintredet, Leiv, (eds). Palgrave Macmillan, 2010. Bolivia has a fascinating history of nonviolent direct action, often tied directly to politics, be it the local or state level. In this campaign, direct action tactics such as organizing street protests and hunger strikes are employed more as forms of popular communication rather than desperate measures. This presidency seems to have been doomed from the start, mostly for economic and political factors that were out of Siles Zuazo's hands. I chose to classify this case as one of social change because of the goals of the labor organizations, which were pushing for radically equal representation for the working class. The campaign did not necessarily espouse a nonviolent ideology: people were ready to use force to overthrow the presidency, and a failed coup (questionably related to the organizers) threatened violence and temporarily kidnapped Siles Zuazo.